I completely understand us rushing to defend the Opera House. I get it. It’s something that only greatness touches. It’s not a billboard for something as tacky as a horse race, it’s a venue that Lleyton Hewitt was married in. I’m not going to go so far and call it pearl-clutching (as it is our crown jewel) but many of us are defending something that we barely use. Yes, it’s nice to look at, and yes, it’s an important location to funnel the tourists into, and yes, it’s a meaningful piece of risky architecture in an otherwise boring metropolis. But for an invaluable bastion of grace and value, we don’t really value it. When was the last time you were there, really? For me, my last Opera House experience was a pre-scandal Rolf Harris articulating the length of his extra leg. Hot take alert, but I think we care so much as our fine city is under attack by something that we attempt to muffle, especially the streets of the harbour city: bogans. We have no stomach for it. Not here. Sydney is that “classy” relative from a working-class family that attempts to mask its roots, and would certainly not entertain the concept of chugging a yard glass at the races. In this house we only allow opera. It’s probably why Badgery’s Creek airport finally got the ok. That way those westies have their own airport so they don’t have to use ours. Scott Morrison’s counter to the criticism emboldened our fears, stating that he’d place an advert for the Bathurst 1000 on the Harbour Bridge if he could.
.@ScottMorrisonMP on using the Opera House to advertise horse racing: I would put an advertisement for the Bathurst 1000 on the Harbour Bridge if I thought it would get people there. 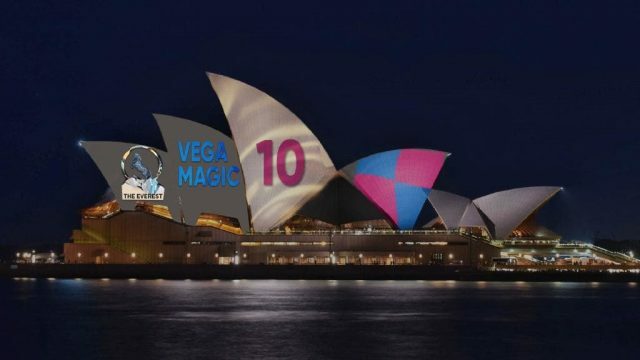 I mean, the obvious paranoia is if the Opera House becomes a billboard, then the rest of our landmarks will be sold off to the highest bidder. It matters because that icon is a symbol. If we let it slide, Fort Denison will become a floating plinth honouring Clive Palmer, The Coca-Cola sign at King’s Cross will fall to marketers and Tom and Nicole’s house (whichever one it is) will operate as a forward operating base for Scientology. The entirety of the city being sold as advertising space should be feared, but it shouldn’t come as a surprise. We have no class, we don’t need it. We’re a city built on the quick buck, logic doesn’t enter into it. MP Alex Greenwich stated that the reason why it wouldn’t fly is that “Sydney isn’t Las Vegas”, which is true enough. But at least Vegas is honest about what it is. Remember, we’re one year removed from a government official rigging a ferry-naming competition that no-one wanted, in order to choose a name that no-one wanted. Maybe we were just due.